This Christmas you can be wearing this Wall-E And Eve Christmas Sweater. The Pixar Christmas sweater is unisex making it look amazing on both men and women and it is made from 55% cotton and 45% acrylic. You can get this Wall-E sweater in adult sizes XSmall – 2XL. The Christmas sweater is dark blue and green and has lots of Christmas lights and other festive details and then on the front you can see a big picture of Wall-E and Eve and they are holding hands and are also holding a string of Christmas lights. 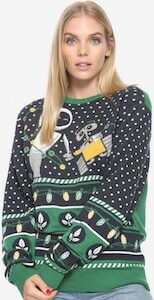 If you like a fun holiday sweater and robots and Wall-E then this is what you should be wearing. 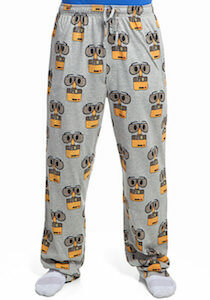 If you like comfy pants for at home and you like robots then you should check out thee Wall-E pajama pants. These fun lounge pants are great for men and women and come in sizes Small – 2XL and they are made from 60% cotton and 40% polyester. On the light grey comfy pants you can find images of Wall-E and yes there are many cute images of this Pixar cleaning robot. Now you can sleep in style or just hang out around the house while wearing these fun Wall-E lounge pants and they even have pockets so that you can carry things with you. If you like Wall-E the cute garbage robot then you want to check out this Wall-E gives Eve flower t-shirt. The Wall-E t-shirt comes in styles for men and women and in sizes Small – 6XL and in colors navy blue and black and is made from 100% cotton. 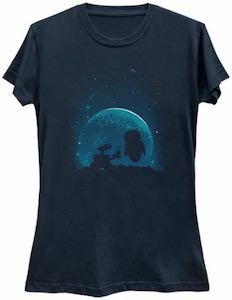 On the shirt you can see the galaxy in the background and even contour of a planet or maybe the moon and in a silhouette view you can see Wall-E giving Eve a flower in pot because he really likes the cute robot. The Wall-E movie is now a true classic and if you like it as much as I do then you should check this shirt out. 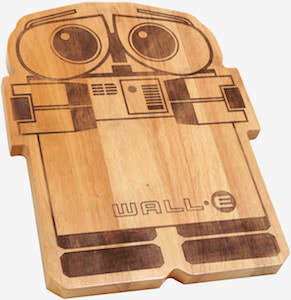 If you like robots and cooking then you just need this Wall-E cutting board. The cutting board is shaped like the Wall-E robot and has the image of the robot on the top so that it really looks like the famous Wall-E. The fun cutting board is made from wood and measures 9 x 12 inches making it just the perfect size to have handy when you have some food to cut in your kitchen. Now your kitchen became a bit more geeky all thanks to the Wall-E robot from Pixar that is always ready for a cutting job. There is Wall-E the Disney robot that was left behind to clean up the mess the people made. But this time Wall-E is trying to survive the forces of nature as he seems covered in a big pile of snow. The snow scene of Wall-E can be found on a fun and cuddly throw pillow that would look stunning on your couch, bed or chair. And you can find Wall-E on both sides of this pillow. The pillow comes in 3 sizes 16, 18 and 20 inch square and it is also available as just a pillow case. If Wall-E is your favorite robot then maybe you should offer him a nice warm place to live instead of the snow he is stuck in now. 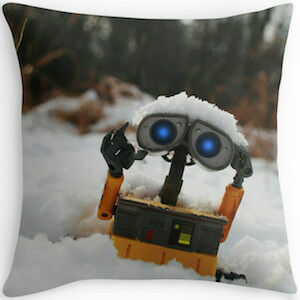 So make room in your home for this Wall-E Throw Pillow. Wall-E is that super cute robot that we left to clean up our mess. OK it was only a movie but the Disney movie Wall-E should warn us about what we are doing to our planet. 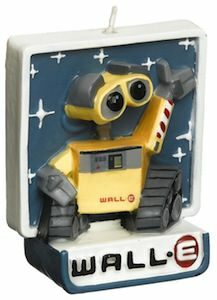 But if you thought Wall-E was cute then you are gone love this figurine of Wall-E. The robot really stares at you as if it would be a life. The figurine of Wall-E is about 3.75 inch tall and is made from vinyl by Funko and it belongs in the long list of amazing Pop Vinyl figurines. 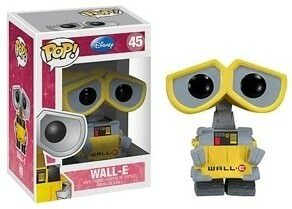 I for sure would love to have Wall-E staring at me all day long. He would be great for on my desk or a book shelve. Find a spot where you would like him and now is the time to adopt your own Wall-E Pop Vinyl Figurine. The cute robot left all by himself to clean the planet of garbage. Wall-E is a cute and good robot who does what is asked of him and to remember him for that there now is this t-shirt. 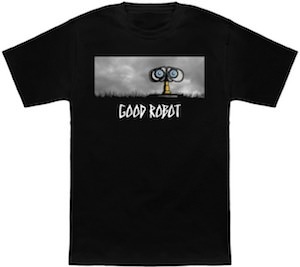 This t-shirt shows the top of Wall-E and below that the words “Good Robot” Wall-E’s piercing eyes staring at you. And this Wall-E t-shirt comes in men, women’s and kids versions in all kind of sizes to make the whole family find the perfect size. A black t-shirt like this can show the world that you didn’t forget the helpful robot. So why wait come and get your Wall-E Good Robot T-Shirt. If you wonder what kind of candle goes on a Wall-E cake then we have the answer. This Wall-E candle is perfect for any cake but specially a Wall-E cake. The candle shows Wall-E the fun yellow robot against a star filled background and below it there it has his name. Burning this candle will be sad as it is so cute but still you found the perfect candle for your cake. And this Wall-E birthday candle is made by Wilton and that means a great quality so that you are sure the candle will burn at you birthday. You just have to take a closer look at this Wall-E Birthday Candle. How to you make a Samsung Galaxy SIII phone look fun and cute? Simple give it a case wtih Wall-E and Eve on it. 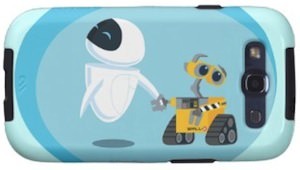 This case is in a couple of shade of blue and shows Wall-E holding hands with Eve and that of course is really cute. The case is made by Case-Mate and is a hard plastic shell with a special chock absorbing liner. And that makes this Samsung phone case a great way to protect your smartphone from harm. And of course this Wall-E case will keep all your ports and buttons availible for you to use with the case on it. If you like robots and Wall-E then get this case to protect your phone, come and order your Wall-E And Eve Samsung Galaxy SIII Case. This is a cute fridge magnet of Wall-E. This Disney robot is staring at the night sky and there he sees the robot love of his live Eve flying around and then there is also his name printed in the sky. The magnet is 2″ square and would look amazing on almost any metal surface. 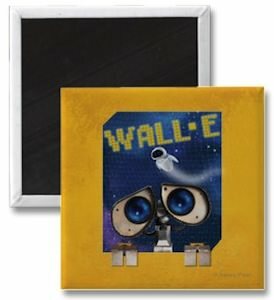 Wall-E fans will love this magnet as it tell a big part of the story of this disney robot and his girlfriend. Come and check out this Wall-E And Eve Magnet.